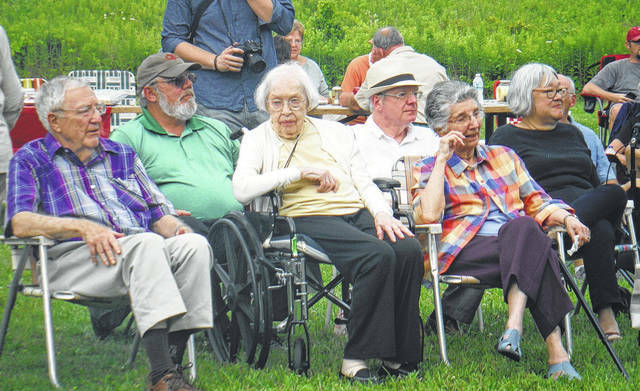 Charlotte Gallant (in wheelchair) celebrated her 100th birthday at Gallant Park, which she donated to Preservation Parks 20 years ago. Thursday was a special day in Delaware — lifelong resident Charlotte Gallant turned 100 years old. Gallant celebrated her centennial at her Willow Brook residence across from the Bob Evans; and later that day, was honored publicly at a park that bears her name. Gallant briefly thanked staff at Preservation Parks at Gallant Woods Park, 2151 Buttermilk Hill Road in Delaware, for transforming her initial donation of 83 acres into a 231-acre park with meadows, prairies, wetlands, woods, a sledding hill and shelter. She made the comments prior to a concert at that shelter, where chocolate and vanilla birthday cupcakes were served to the audience. Visitors also signed a poster with their well-wishes and “Happy Birthday” was sung to her.